After two years with Forest Grove circuit board manufacturer Westak, Tom (not his real name) was let go last year and has been unemployed since. Sometimes Tom gets donations, he said, which help him to cover the $700 monthly rent for his one-bedroom apartment. But most often, people will curse at him, call him names and tell him to get a job. Yet Tom can’t simply settle for an opening anywhere, and he lacks the higher education and qualifications to obtain a well-paying position. “Minimum wage jobs don’t cover my bills,” he said, and he’s already getting help from his parents — who don’t know he panhandles at all. A Washington County census conducted in January 2015 found a 35 percent average increase in one-bedroom rents since 2012, which collides with an already-low 2 percent average vacancy rate in rental housing. And confirming Tom’s dilemma, the study also found that although the county’s unemployment rate has dropped from 9 percent in 2009 to 4 percent in 2015, more than one-third of available jobs pay lower-end wages. Following the 2008 recession, the number of cost-burdened housing units in the county — individuals and families where 30 percent or more of their household income pays for housing — increased by 8,500 units, for a total estimate of nearly 40,000 cost-burdened units, Bransford said. 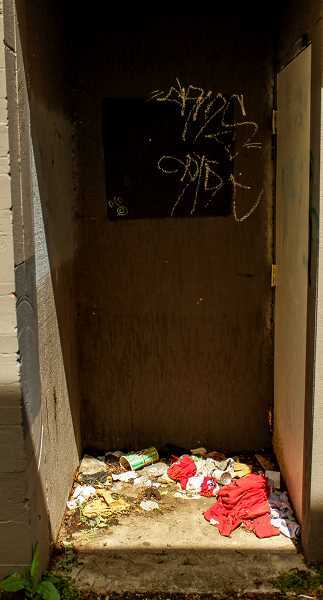 HILLSBORO TRIBUNE PHOTO: TRAVIS LOOSE – An alleyway in downtown Hillsboro shows signs of use as a toilet and trash can. Alcoves and doorways, such as this, were in part the genesis for an April Hillsboro Neighborhoods Coalition meeting to address a perceived increase in panhandling, homeless camping and camping debris. Cleanup of this area is the business owners responsibility. Though the number of homeless people in Washington County has decreased by roughly 180 individuals during the past year, residents and business owners across the county have reported a noticeable uptick in visible homeless people and panhandlers in places like Forest Grove’s Safeway parking lot and on the streets in downtown Hillsboro. A dirty, sweat-stained baseball cap covers the man’s face, blocking the midday sun. 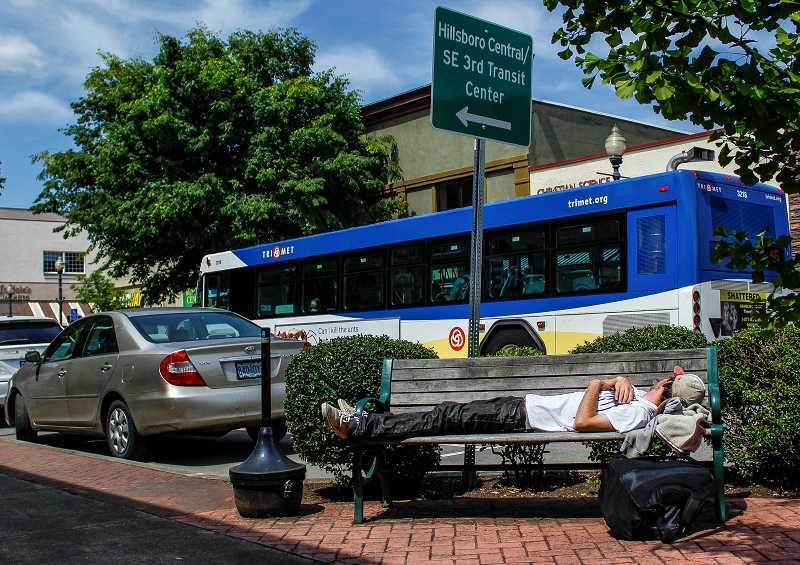 Lying on the bench in front of Premier Community Bank on Main Street in downtown Hillsboro, his soft snoring blends with the sounds of people and cars passing by. When the sun becomes too hot, he moves to the sidewalk and continues his slumber as pedestrians walk around him — still taking little notice he’s there. When approached, he asks only to use a phone. He looks like he’s been roughing it for some time, but offers no details for how he got there or where he’s going. He doesn’t even want to share his name. He’s homeless, that much is clear, and after a short time he picks up his bag and moves along — but he never really leaves. That’s where Community Connect comes into play. A single-point-of-entry phone intake service, Community Connect is composed of more than 20 agencies covering a broad range of service needs for homeless youth, veterans and families and people at imminent risk of becoming homeless. Business owners and citizens throughout the county have been encouraged to distribute the Community Connect phone number — listed on a simple, bilingual lime-green card — to panhandlers in lieu of money, and to anyone else who appears to be homeless. After connecting to a Community Action of Washington County operator, the caller is interviewed and scheduled to meet with a community resource advocate so their specific needs can be identified and addressed. The interview responses are then logged through the Homeless Management Information System (HMIS), which shares individual information so callers aren’t required to share their stories more than once — which Evans identified early-on as a barrier for many people who seek assistance. And for those who don’t own or have direct, easy access to a phone, four homeless drop-in centers in Washington County (see info box) will allow people who need to contact Community Connect to use the offices’ phones, as well as make contact with homeless outreach workers and community partners that serve the homeless, Evans said. For more information on Community Connect, visit Washington County’s official website at bit.ly/1TNHXbE or call 503-640-3263 for service.